District Legal Services Authority, Dibrugarh. 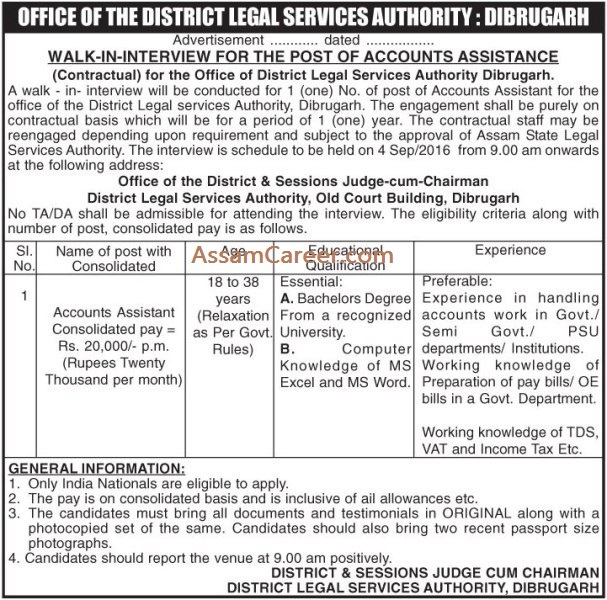 A walk in interview will be held for filling up of the following post under District Legal Services Authority, Dibrugarh in contractual basis. Educational Qualification: Graduate from a recognized university having computer knowledge in MS Word and MS Excel. How to apply: Candidates must bring all original documents, two copies of photographs along with a set of photocopies of the same to the interview. Interview Date: 4th September 2016 from 9 AM onwards. Venue: O/o the District & Sessions Judge, Old Court Building, Dibrugarh.